A special edition, multiplayer-only Nintendo DS game released exclusively through Club Nintendo in Japan for 500 points. The city of Ooedo is under attack. 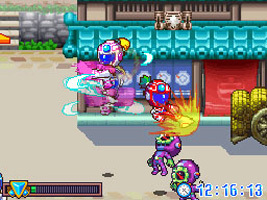 2-3 players must choose from five sentai superheroes and fight through waves of enemies. You control the characters by speaking their moves into the Nintendo DS microphone. Moves will be more powerful the louder you shout, and if all players shout the same attack at the same time, a special move can be unleashed.